Good morning friends of Dies R Us ~ Do you have a special birthday that you want to celebrate with more than just a typical card? 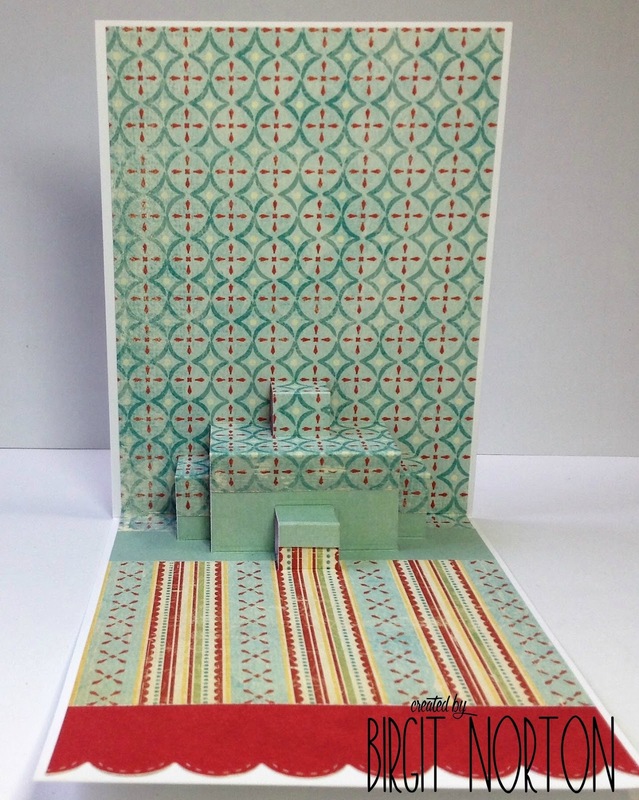 Birgit here with you today and I've got a fun pop-up card for you. Let's start with the inside of the card first. 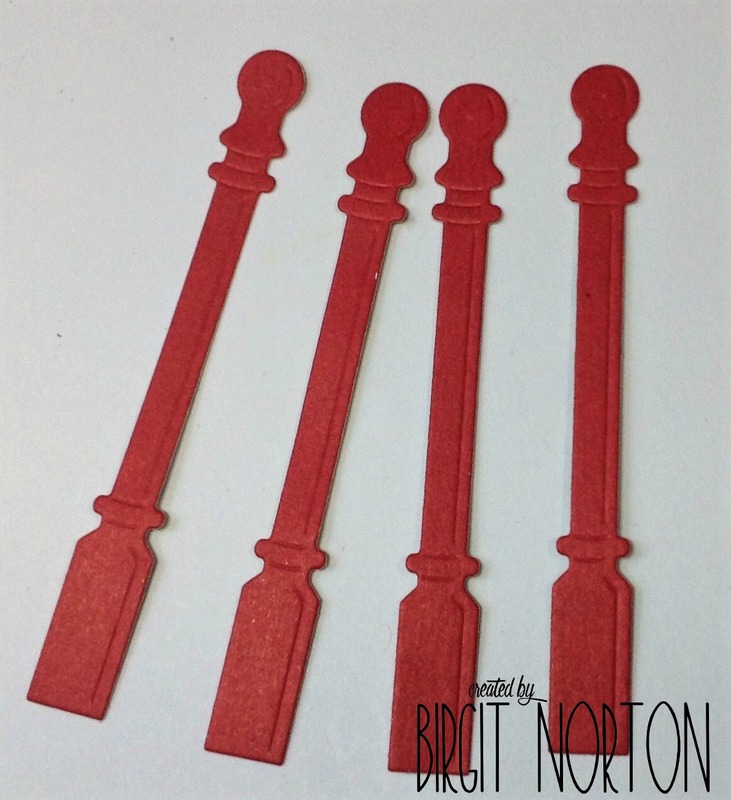 Elizabeth Craft Designs offers many Pop-Up choices. They're so easy to use and the design possibilities are endless. I chose this wonderful cake plate from Elizabeth Craft Designs Christmas Pudding which I have enjoyed using since it was first released. 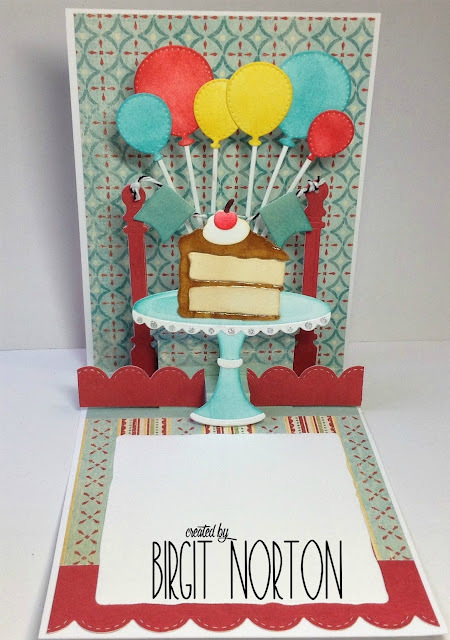 I add a bit of color using Distress inks, add the trim pieces and embellish with Stickles. 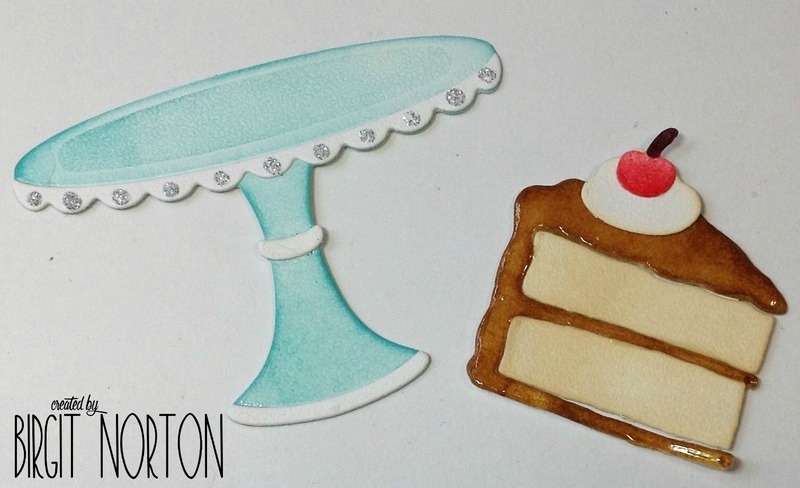 The Impression Obession Cake Set is colored in the same way and I added some Glossy Accents to the frosting. YUM! These banner posts are part of the Lots of Pops die set. I cut four of them so that I can double them up for stability. This is what the banner will be strung through. 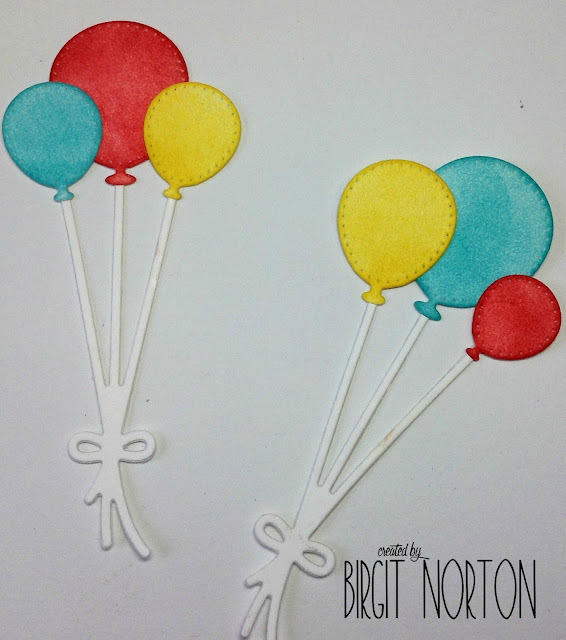 I cut several Poppystamps Celebration Balloons out of white card stock. I added color using Distress Inks and attached them to some balloon strings. Assemble the inside of the card using each pop up for different design elements. I like to keep the front of the card fairly simple. I added this adorable Panda / Bear from Marianne Designs (another special order die) and gave him a little cupcake to hold and added a candle from the Impression Obsession Cake Set. Two more Poppystamps Balloons float above the panda to add fun this special celebration. The other dies I used can be purchased during their next Special Order event so please sign up for their newsletter. WOW......this is fabulous Birgit!! 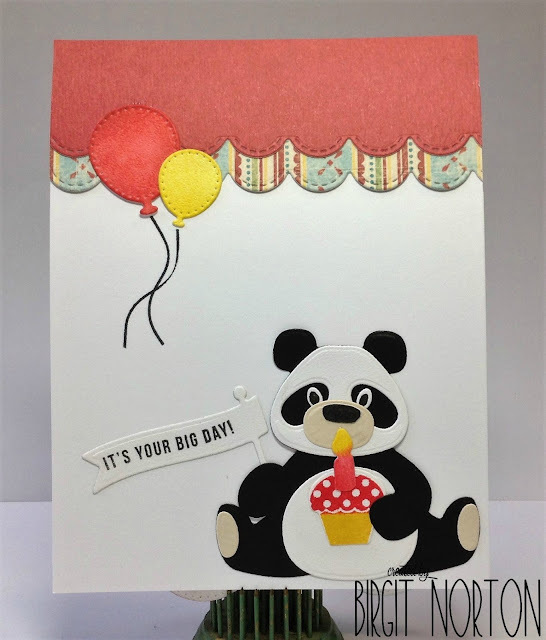 Such a clever idea, I love all the detail on your card, from the panda to the balloons and finally that very real looking piece of cake! Great inspiration and tutorial, thank you! AWESOME creation Birgit! What fun and the recipient of this fabulous creation is going to squeal in delight upon opening! Wonderful inspiration! Thanks for all the details ... well done! OMGoodness, Birgit! This is one BIG celebration card! Love that sweet cupcake holding Panda, those pretty banners and fun balloons.....and then you open it. WOW!!! 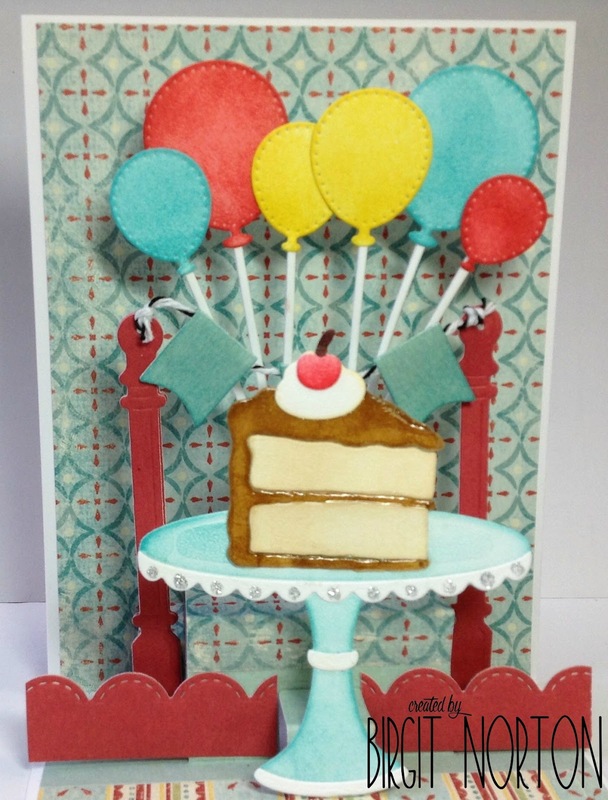 That yummy cake and pedestal and more fun balloons! This is FAB all over!!! Love it! Oh Wow, how fun is that, the panda is just totally adorable with his little cupcake, love the fun surprise of opening the card, with the balloons and banner and cake, love all the colors, Fantastic! Love, love, love this card, Birgit! You are so talented and put so much time into your cards and it always shows. 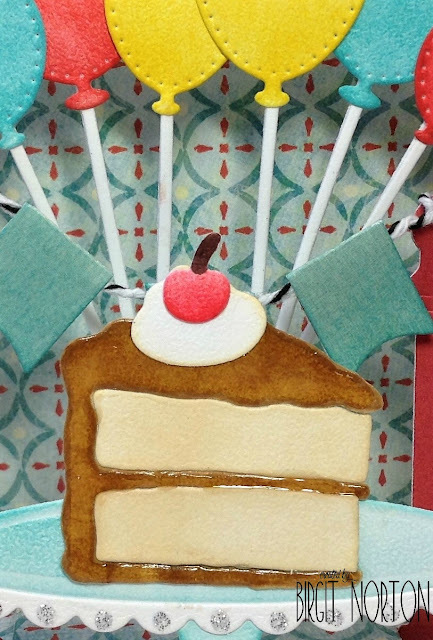 You chose a great bunch of dies that work so well together and LOVE the frosting on that cake. Awesome! awesome! the cake is amazing! I love every little detail!